One might wonder why, in a scriptural expose of the doctrines of the Catholic Church, I would choose this subject The Roman Interpretation of the Lord's Supper (more commonly known as "Communion") for the first of the "Catholic Chronicles." Most Protestants (today, Protestants are considered to be members of any church or church-group outside the Roman Catholic or Eastern Orthodox churches) would expect me to deal with what they might consider the more obvious departures from biblical foundation such as the worship of and prayers to the Virgin Mary, the infallibility of the pope, purgatory and prayers for the dead, the history of the torture and burning of accused "heretics" and such like that, and no doubt in future installments we shall look in-depth at each of these. But for this first article I believe that we should get right to the root, before we begin exploring the branches of Roman Doctrine and practice. And any Catholic who has even a small knowledge of his church knows that the central focus of each gathering (known as the "mass") is the Holy Eucharist. The word "Eucharist" is a Greek word that means "thanksgiving". In the gospel accounts of the Last Supper, Jesus is described as "giving thanks" before breaking the bread (Luke 22:19), and so this word became a proper name for the Lord's Supper in the early Catholic Church. Today, it is more commonly associated with the elements in communion, especially the host or "wafer", although the ceremony itself is still called "The Holy Eucharist". Now, you might be wondering why I'm taking so much time and effort to explain something as harmless as the ceremony known around the world as communion. If you've ever been to church at all, (Protestant or Catholic), you've probably taken part in a communion service. So why make all this fuss about bread and wine? Why? Because that's where the similarity between evangelical communion services and the Roman Catholic Mass ends - at the bread and the wine! That 18-letter word above is a complete theological statement…and the name of a doctrine, out of which springs the most astounding set of beliefs and practices that has ever been taught in the name of religion. Very, very few people know what the Catholic Church actually believes and teaches concerning this subject. and I am convinced that even fewer Catholics realize themselves what they are taking part in. From earliest childhood, "This is the body of Christ" is all they've ever heard when the priest gingerly placed the wafer on their tongue. And as they grew up it was so natural and part of normal religious life, that their minds never even questioned the fact that Jesus Christ, Himself, was actually in their mouth! It might be hard for you to believe, but that's exactly, literally, what "transubstantiation" means. The Roman Catholic Church teaches their flocks that the bread and the wine used in the Mass actually, physically, turns into the flesh and blood of Jesus Christ after the priest blesses it during the liturgy (ceremony). Although this in itself might shock you, it is really only the beginning. For the implications and practical conclusions of this doctrine are absolutely mind-boggling. "To explain the Catholic Church would take volumes, but basically the Catholic Church was founded by Jesus Christ when He was here on earth. It is the only church founded by Jesus. 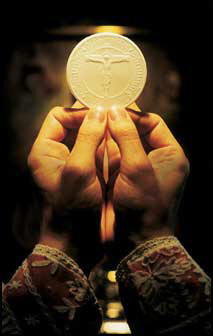 The greatest asset of our church is that we have Jesus present in the Holy Eucharist. He is really here, body, soul and divinity. He is God and in His omnipotence can do anything He wishes, and He decided to remain with us until the end of the world in the form of the host (the "wafer") in Holy Communion." If you think this is just the isolated opinion of someone on the fringe of the church, or that the Catholic Church as a whole does not really believe or teach this, I beg you to read on. For not only is this the official teaching of Rome, but according to irreversible church decree (called dogma), anyone who does not hold to this belief, in the most explicit detail, is accursed and damned forever! When Europe was electrified by the eloquent preaching of the sixteenth century Reformation, the Roman Catholic hierarchy gathered together. Her theologians worked for three decades on the preparation of a statement of faith concerning transubstantiation. 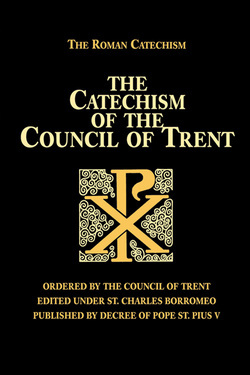 This document remains, to this day, the standard of Catholic doctrine. Canon I: "If any one shall deny that the body and blood, together with the soul and divinity of our Lord Jesus Christ, and therefore entire Christ, are truly, really, and substantially contained in the sacrament of the most Holy Eucharist; and shall say that He is only in it as a sign, or in a figure, let him be accursed!" Canon II: "If any one shall say that the substance of the bread and wine remains in the sacrament of the most Holy Eucharist, together with the body and blood of our Lord Jesus Christ...let him be accursed!" Canon III: "If any one shall say that Christ, the only begotten Son of God, is not to be adored in the holy sacrament of the Eucharist, even with the open worship of Latria, and therefore not to be venerated with any peculiar festal celebrity, nor to be solemnly carried about in processions according to the praiseworthy and universal rites and customs of the Holy Church, and that He is not to be publicly set before the people to be adored, and that His adorers are idolaters - let him be accursed!" "THE WORSHIP OF THE HOST"
"You shall not make unto you any engraved image...You shall not bow down yourself to them, nor serve them..." The 2nd commandment (Ex.20:4-5). "God is spirit, and those who worship Him must worship in spirit and truth." John 4:23. In Canon VI, a rite of worship called "Latria" was spoken of. This is not just an "ancient custom", it is thoroughly practiced today in every Mass. After the bread has been supposedly "changed" into Christ by the priest, it is placed in a holder called the monstrance. And before this monstrance the Catholic must bow and worship (this act is called "genuflecting") the little wafer as God! Sometimes they have processions where they solemnly march, as the congregation bows and offers praise and worship to this piece of bread! The Roman teaching that Jesus Christ is physically present in each morsel of bread creates many other doctrinal and practical problems. For instance, when the service is over, what happens to all those leftover wafers that have been "changed into Christ"? Do they change back into bread again when the priest goes home? I'm afraid not. For according to Canon IV of the Council of Trent, they stay flesh! And don't think that 400 year-old decree is just some dusty old manuscript in a museum case somewhere. It still is completely adhered to and passionately practiced. As an example, here is a passage from an official Catholic home instruction book, copyrighted 1978: "Jesus Christ does not cease to exist under the appearances of bread and wine after the Mass is over. Furthermore some hosts are usually kept in all Catholic churches. In these hosts, Jesus is physically and truly present, as long as the appearances of bread remain. Catholics therefore have the praiseworthy practice of 'making visits' to our Lord present in their churches to offer Him their thanks, their adoration, to ask for help and forgiveness; in a word, to make Him the center around which they live their daily lives." ("The Spirit of Jesus" Catholic Home Study Instruction Course, Book #3, p.92.) That is an incredible interpretation of how to make Jesus the center of your daily life! "WHEN DID THIS TEACHING BEGIN?" The teaching of transubstantiation does not date back to the Last Supper as most Catholics suppose. It was a controversial topic for many centuries before officially becoming an article of faith (which means that it is essential to salvation according to Rome). The idea of a physical presence was vaguely held by some, such as Ambrose, but it was not until 831 A.D. that Paschasius Radbertus, a Benedictine Monk, published a treatise openly advocating the doctrine. Even then, for almost another four centuries, theological war was waged over this teaching by bishops and people alike, until at the Fourth Lateran Council in 1215 A.D., it was officially defined and canonized as a dogma, (A "Dogma" is a teaching or doctrine that can never be reversed or repealed. It is equal in authority to the Bible), by Pope Innocent III. 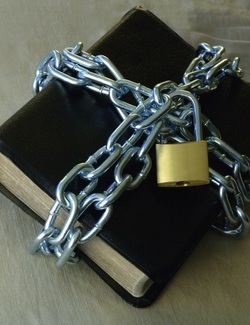 "HOW ROME VIEWS THE BIBLE"
"The teachings of the Church will always be in keeping with the teachings of the Scripture…and it is through the teaching of the Church that we understand more fully truths of sacred Scripture. To the Catholic Church belongs the final word in the understanding and meaning of the Holy Spirit in the words of the Bible." Any thinking person can see how such a mode of interpretation can be dangerously used to manipulate Scripture to mean absolutely anything at all! Who has not observed this of the various cults? The Moonies, Mormons, and Jehovah's Witnesses all back up their false teachings with "new revelations" and "inspired interpretations" of the Scriptures each claiming that the Holy Spirit revealed these new truths to their founders. One opens themselves to all kinds of deception when they judge the Bible by what their church or pastor teaches, instead of judging what their church or pastor teaches by the Bible! With this in mind, we will briefly discuss the two main passages of Scripture that the Roman Church uses while trying to show that Jesus Himself, taught transubstantiation. John 6:54-55: "He who eats My flesh and drinks My blood has eternal life; and I will raise him up on the last day. For My flesh is true food, and My blood is true drink." Catholics are taught here, that Jesus is explaining how He is literally offering them His flesh and blood, so that they may have eternal life by physically eating Him. With just a little study of the whole passage (vs. 27-71), it is clear that Jesus was not talking about physical, but spiritual food and drink. Matt. 26:26 and 28: "This is My body...this is My blood." Catholics base their whole religious system on their interpretation of these two verses. They adamantly teach that right here, Jesus is pronouncing the first priestly blessing that mysteriously changes the bread and wine into His body and blood. The absolute folly of such a conclusion is proved by this one observation: He was literally still there before, during, and after they had partaken of the bread and the cup! He was not changed into some liquid and bread - His flesh was still on His bones, and His blood still in His veins. He had not vanished away to reappear in the form of a piece of bread or a cup of wine! Let's look closer at His words. No one can deny that here we have figurative language. Jesus did not say touto gignetai ("this has become" or "is turned into"), but touto esti ("this signifies, represents" or "stands for") (the New Testament was written in Greek). It is obvious that Jesus' meaning was not literal but symbolic! And He wasn't the first in the Bible to claim figuratively that a glass of liquid was really "blood." One time, David's friends heard him express a strong desire for water from the well of Bethlehem. In spite of extreme danger, these men broke through the enemy lines of the Philistines and brought the water to him. When David found out that these men had risked their lives in this way, he refused to drink the water, exclaiming, "Is not this the blood of the men who went in jeopardy of their lives?" (II Sam.23:17). Throughout the gospels we find similar metaphorical language: Jesus referring to Himself as "the Door", "the Vine", "the Light", "the Root", "the Rock", "the Bright and Morning Star", as well as "the Bread". The passage is written with such common language that it is plain to any observant reader that the Lord's Supper was intended primarily as a memorial and in no sense a literal sacrifice. "Do this in remembrance of Me" (Luke 22:19). "SO WHY DO THEY TEACH IT?" Before concluding our first chronicle, the question needs to be asked, "Why does the Roman Catholic Church need to have such a doctrine. Why do they think that Jesus needs them to physically eat Him? That is what truly puzzled me as I read astounded through the catechism and doctrinal instruction books. But the answer to that question is not a pretty one. As I said before, the implications and practical conclusions of the teaching of transubstantiation are substantially worse than the doctrine itself and like a great web spun by an industrious spider, Rome's teachings spiral out from this central hub like the spokes of a wheel. In the following Catholic Chronicle we will look intently at the next direct result of transubstantiation in official Catholic systematic theology: "The Sacrifice of the Mass."